DENTON, TX — The Nighthawk Composite Squadron was honored with an award from the City of Denton Office of Emergency Management. 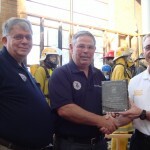 Denton Emergency Management Coordinator Michael Penaluna, presented the award to Nighthawk Composite Squadron commander, Major Steve Robertson following a tabletop exercise held at the Emergency Operations Center for the City of Denton. The award recognizes the Nighthawk Composite Squadron’s outstanding efforts in in supporting emergency preparedness activities in the City of Denton. The award acknowledges the squadron’s participation in a number of full scale and tabletop exercises. During one full scale exercise simulating an intersection crash and derailment of a Denton County Transit Authority train the squadron self – funded a flight to provide aerial observation and assessment to the Incident Command Post and provide aerial imagery of the entire exercise. Most recently the squadron provided aerial imagery that was the basis of a dam breach tabletop exercise in which downtown Denton was inundated from the catastrophic failure of the North Lakes dam. Members of the squadron are active with the Denton Emergency Preparedness Advisory Council (DEPAC). DEPAC is a county wide council which meets monthly to discuss ways to promote a safe Denton community through proactive preparation for physical and environmental disasters by providing advice and support for prevention, education and response readiness.